Synthetic peptide within Human CHST6 aa 303-333 (C terminal) conjugated to Keyhole Limpet Haemocyanin (KLH). The exact sequence is proprietary. 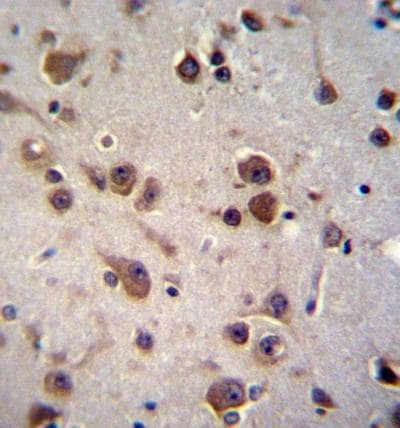 NCI-H460 cell lysate; Human brain tissue. ab170753 is purified through a protein A column, followed by peptide affinity purification. Our Abpromise guarantee covers the use of ab170753 in the following tested applications. WB 1/100 - 1/500. Predicted molecular weight: 44 kDa. Sulfotransferase that utilizes 3'-phospho-5'-adenylyl sulfate (PAPS) as sulfonate donor to catalyze the transfer of sulfate to position 6 of non-reducing N-acetylglucosamine (GlcNAc) residues of keratan. Mediates sulfation of keratan in cornea. Keratan sulfate plays a central role in maintaining corneal transparency. Acts on the non-reducing terminal GlcNAc of short and long carbohydrate substrates that have poly-N-acetyllactosamine structures. Expressed in cornea. Mainly expressed in brain. Also expressed in spinal cord and trachea. Defects in CHST6 are the cause of macular dystrophy, corneal, 1 (MCDC1) [MIM:217800]. An ocular disease characterized by bilateral, progressive corneal opacification, and reduced corneal sensitivity. Onset occurs in the first decade, usually between ages 5 and 9. Painful attacks with photophobia, foreign body sensations, and recurrent erosions occur in most patients. The disease is due to deposition of an unsulfated keratan sulfate both within the intracellular space (within the keratocytes and endothelial cells) and in the extracellular corneal stroma. Macular corneal dystrophy is divided into the clinically indistinguishable types I, IA, and II based on analysis of the normally sulfated, or antigenic, keratan sulfate levels in serum and immunohistochemical evaluation of the cornea. Patients with types I and IA macular corneal dystrophy have undetectable serum levels of antigenic keratan sulfate, whereas those with type II macular corneal dystrophy have normal or low levels, depending on the population examined. Note=CHST6 homozygous missense mutations have been observed in patients with macular corneal dystrophy type I, while type II patients show a large deletion and replacement in the upstream region of CHST6. The only missense mutation for type II is Cys-50, which is heterozygous with a replacement in the upstream region on the other allele of CHST6. Belongs to the sulfotransferase 1 family. Gal/GlcNAc/GalNAc subfamily. Immunohistochemical analysis of formalin-fixed, paraffin-embedded Human brain tissue, labeling CHST6 with ab170753 at 1/10 dilution, followed by peroxidase-conjugated secondary antibody and DAB staining. ab170753 has not yet been referenced specifically in any publications. Publishing research using ab170753? Please let us know so that we can cite the reference in this datasheet. There are currently no Customer reviews or Questions for ab170753.